Representative Alexandria Ocasio-Cortez, with Senator Ed Markey at her side (right), announced “Green New Deal” legislation to promote clean energy programs in Washington, D.C., Thursday. Massachusetts Senator Edward J. Markey, a grizzled veteran of environmental battles facing reelection in 2020, on Thursday joined with Representative Alexandria Ocasio-Cortez of New York, the freshman Democratic superstar, to introduce the “Green New Deal,” an ambitious plan to combat climate change and radically transform the American economy. The intergenerational partnership between Markey, a 72-year-old who was first elected to Congress in 1976, and Ocasio-Cortez, a 29-year-old leader of the young progressive vanguard, could help the senator advance one of his top priorities while burnishing his credentials with millennial activists who have become a powerful force in Democratic politics. Often overshadowed by the senior US senator from Massachusetts, Elizabeth Warren, Markey has been considered vulnerable to a primary challenge by an insurgent Democrat like Ocasio-Cortez, such as US Representative Ayanna Pressley of Massachusetts, both of whom harnessed the energy of young voters, women, and people of color to knock off older, white, male 10-term incumbents last year. At a joint press conference Thursday, Markey introduced Ocasio-Cortez as his “fantastic partner,” cementing a relationship that formed just last month over a two-hour lunch in the Capitol. The senator said that, despite the long odds the Green New Deal faces in Congress, he is encouraged by the growing movement of young activists who have been pushing for dramatic action to combat climate change. “The green generation has risen up and they are saying they want this issue solved,” Markey said at the press conference in Washington. Ocasio-Cortez, as the youngest woman ever elected to the House, has been helping to mobilize that generation, often upsetting the Democratic old guard. In November, she gained national attention when she joined young activists who staged a sit-in outside Nancy Pelosi’s office to demand action on climate change. The protest was organized by two young progressive groups, Justice Democrats and the Sunrise Movement, whose 25-year-old cofounder, Varshini Prakash, was Markey’s guest at the State of the Union speech on Tuesday. Ocasio-Cortez said the movement against climate change has reached “a major watershed moment” as more Americans demand action. “We need to save ourselves, and we can save the rest of the world with us,” she said. The Green New Deal, however, is only a nonbinding resolution that sets forth a series of sweeping policy goals. The measure calls for a 10-year effort to transition the country to clean, renewable, and zero-emission energy sources, eliminating pollution and greenhouse gas emissions as much as is technologically feasible. The resolution also says every American should be guaranteed a job with a “family-sustaining wage,” paid vacations, retirement security, high-quality health care, and affordable, safe, and adequate housing. The plan does not say how each of the goals is to be achieved. 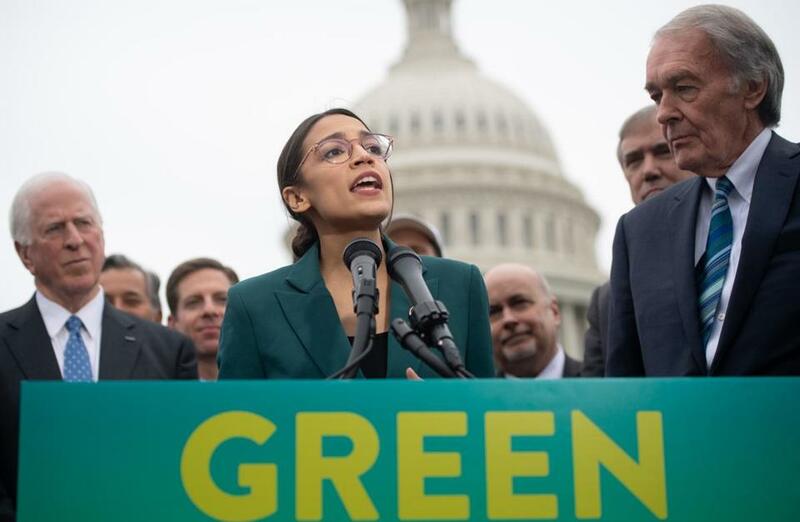 Markey and Ocasio-Cortez said the aim is to lay down a marker for Congress, which could decide which “Green New Deal” projects to approve. “We are open to whatever works,” Markey said. With the exception of Senator Sherrod Brown of Ohio, all of the declared and potential Democratic presidential candidates from the Senate — Amy Klobuchar of Minnesota, Kirsten Gillibrand of New York, Kamala Harris of California, Cory Booker of New Jersey, Bernie Sanders of Vermont, and Warren — support the Green New Deal, Markey’s office said. Perhaps more troubling for supporters of the Green New Deal was the shade thrown by Pelosi, the Democratic House leader. Markey downplayed the dig on Thursday. He praised Pelosi as a leader on climate change, an issue he has been focused on for decades. As a 35-year-old congressman, he declared at the 1980 Democratic National Convention that the United States should be a “truly solar society” by 2030. In the years since, he has pushed for greater energy-efficiency standards for appliances and cars, and less reliance on fossil fuels. In 2009, he sponsored the last major climate bill to pass the House, only to see it die in the Senate, where it was never brought up for a vote. But by teaming up with Ocasio-Cortez, Markey could inject fresh energy into the fight, said Dan Payne, a Democratic strategist who has worked for the senator.